Any impact sockets that you need to ensure your job will get done right and safely. We will supply you with standard or special designed Impact Sockets, Impact Drivers, Extensions, Adaptors, Universal Joints and other accessories. 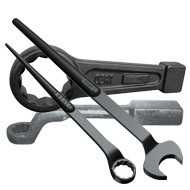 Large program of industrial wrenches and spanners: Flat and Offset Striking Spanners, Open, Ring and Ratchet for Construction application and Super Duty Pneumatic Impact Wrenches. 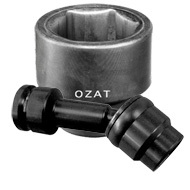 Ozat 2000 ltd. offers an unparalleled range of top quality impact sockets. Ozat manufacture standard sizes impact sockets as well as special designed impact sockets. We provide and square drive impact socket from ¼" to 4½", No 4 and No 5 spline drive impact sockets. Bigger drive and any other spline drive impact sockets are also available. ATP Industrial air tools, Impact Wrenches, Abrasive Tools, Percussion Tools, Air Drills and other product are designed with durability in mind, from the vanes turning the motor to the hammer frames and anvils. 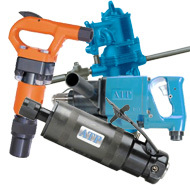 ATP Air tools designs with a common sense approach to the features of our products, we don`t compromise quality. ATP has been manufacturing replacement parts for most of the industry`s recognized professional Impact Wrenches for decades, meeting all industry specifications, delivering on time and on budget.